Okay, I found it. The Gemini suit your father wore is serial #2 (G2C-2). When I saw it, the suit was in storage at the Alabama Space and Rocket Center, which is now the U.S. Space and Rocket Center (USSRC) in Huntsville, Alabama. I photographed the suit during a photographic inventory I performed in 1989 and 1991 of suits in storage. The name Laine stuck in my mind since it was not an astronaut's name. I presume the suit is still there, although during the Save America's Treasures project all Smithsonian owned suits were brought back to the Smithsonian for protection and preservation. I believe this suit is mostly likely owned by the USSRC, so it should be still be in Huntsville. Management of the collections at the USSRC has changed and I am not sure if they have the inventory catalog I provided them at the time. So they may not know they have the suit. Now that you know the serial number they should be able to find it. It's not the best quality photo but should help them locate the suit. 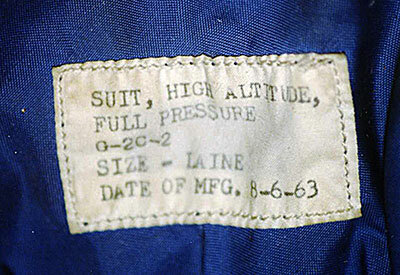 The NASA vector patch is missing and the name tag on the front of the suit is faded but still readable. After the jump program was over, it appears the suit was modified to test liquid cooling in the suit by the addition of the two aircraft AN fittings on the lower abdomen of the suit. I have seen this modification on another Gemini suit as well. The brown areas on the suit are where the aluminum coating has degraded, exposing the brown plastic coating which was applied on the fabric in preparation for the aluminization. I did not check the glove to see if was the correct serial number glove, and I do not know the location of the helmet. I will check and see if the helmet is in another archive. In the material that you have, are the names of the other parachutists identified? Hope this helps.